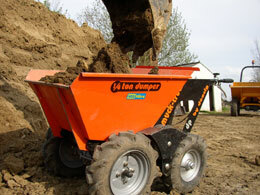 This 1/4 ton dumper is an exceptional machine for moving building materials and aggregate. This 4-wheel drive power unit is narrow enough to fit through the average doorway for internal work, slip down side alleys or climb over steps and footings. Tips safely and easily directly into a skip with an optional skip loading ramp.